SOULBURN was assembled by guitarist Eric Daniels and drummer Bob Bagchus, both previously members of premier Death Metal band ASPHYX. The duo was joined by erstwhile PENTACLE vocalist / bassist Wannes Gubbels. 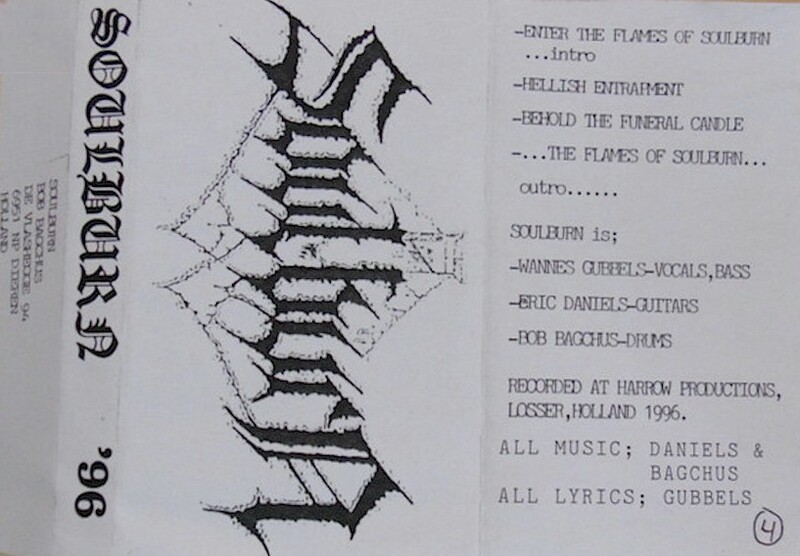 Indeed, for all intents and purposes SOULBURN was a continuation of ASPHYX under another guise. The 'Feeding On Angels' debut arrived in June of 1998 on the Century Media label. SOULBURN invariably included such ASPHYX classics as Abomination Echoes’, ‘Vermin’ and ‘The Sickening Dwell’ in their live set and once rehearsals got underway for a further album the band members realised the new material was sounding much more in an ASPHYX vein, so duly reverted back to their former title. Xerox covers with regular tapes.